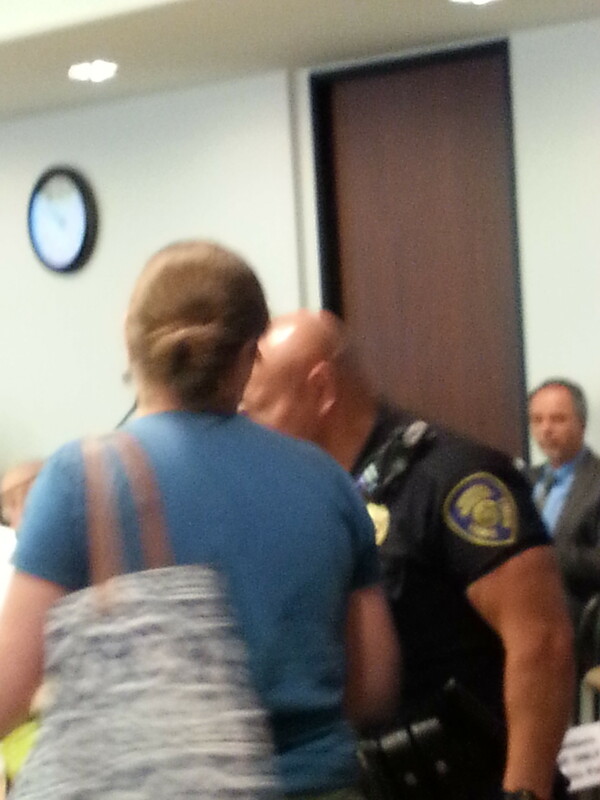 San Diego, CA – Nearly a dozen volunteers with the local nonprofit group SanDiego350 had their mic shut off one after the other at a SANDAG Board meeting Friday, and two were escorted out by security staff when they continued speaking (video clip). Their comments followed the first of two required readings of a ballot measure that would increase the county sales tax by a half cent to fund transportation projects which speakers said are inconsistent with state greenhouse gas (GHG) emission reduction targets. Residents from across the county refused to relinquish the mic after their allotted time ran out. Many held “traffic” signs saying “Wrong Way - Do not Enter”. A key problem speakers identified is SANDAG’s plans for new and expanded highways instead of building a well-designed public transit network. They said it is both a climate issue - because of the failure to achieve the GHG emissions reductions needed - and a justice issue - because few transportation options are provided for inner city, low income people who often do not have a car and spend an inordinate amount of time commuting.They also called for a smooth transition to local green jobs governed by labor agreements. Speakers pointed out that the mix of highways and transit projects to be funded by the ballot measure is worse for GHG emissions than the overall transportation plan. Instead, they supported a vision statement produced by the Quality of Life Coalition - a broad coalition of San Diego environmental and labor groups that calls for SANDAG to course-correct on transportation planning. They also felt strongly that SANDAG should not be using taxpayer funds to pay for a slick PR operation that misrepresents their plan. SANDAG spent half a million dollars on outside media consultants before the vote on the “San Diego Forward” plan. That was in addition to more than $1 million in salaries for 12 in-house communication staff members and three interns. SanDiego350 is an inclusive volunteer organization devoted to inspiring a movement to prevent the worst impacts of climate change and climate injustice. We strive to create a future that supports a livable planet and just society through education and outreach, public policy advocacy, and mobilizing people to take action.. We are affiliated with 350.org, the international climate organization, whose work inspires us.